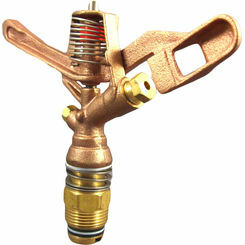 Impact sprinklers are not as widely used as they once were in residential areas, but they are still a great option. 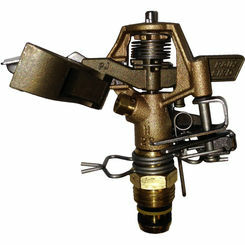 They are often used in fields or other non-residential areas. 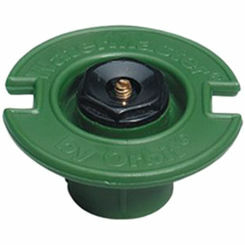 Flush sprinkler heads can be used on small lawns. 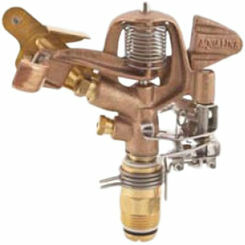 We have all the best deals on sprinklers here at PlumbersStock, and you can get your entire yard looking great by saving on sprinkler timers, valves, landscape supply, sprinkler pipe, fittings, and more. Some people refer to impact sprinklers as Rain Bird Sprinklers. 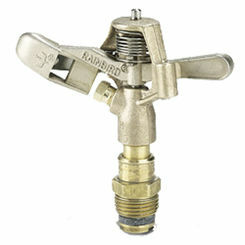 Rain Bird was the first company to make and distribute the impact sprinkler head, which is why there is confusion over the name. Impact units are commonly recognized by the distinctive clicking noise. 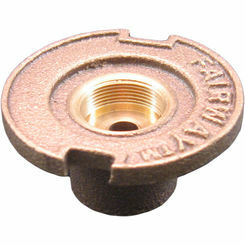 The clicking noise is created by the function of the sprinkler head. 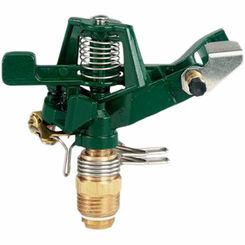 The sprinkler head is driven in a circular motion through the assistance of a spring loaded arm. The arm will pull back on the spring and the tension then propels it forward. 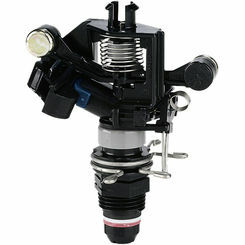 As it makes contact with the water stream, the head is rotated slightly. 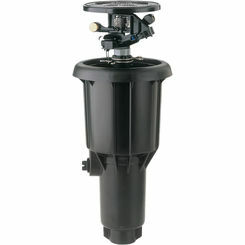 This allows for full coverage of the area to which the water is being applied. 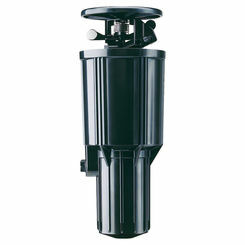 The construction of impact sprinkler heads allows for an uninterrupted flow of water. 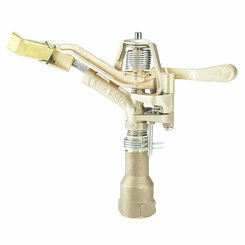 This helps to keep any dirt or sand from clogging the sprinkler head and makes it less vulnerable to damage. 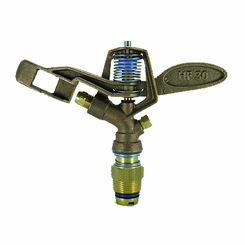 If your sprinkling system runs off of well water or low water pressure, then impact sprinklers are a great choice. They typically range in arc patterns from 40 to 360 degrees. 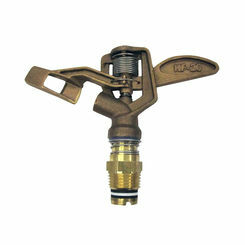 The spray radius for the majority of impact sprinklers is 20 to 150 feet. Both the arc and the radius can be easily adjusted. The distinctive clicking noise is often considered to be too loud or annoying for residential areas, but it is still used in some places. They are often made of either brass or bronze, but also come in plastic varieties. The brass and bronze varieties make for a higher initial cost but they tend to last much longer than the plastic variety which could save you money in the long run. 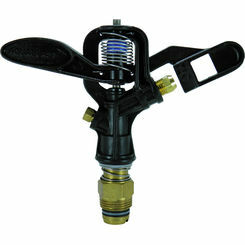 As the name would imply, flush sprinklers can be mounted flush with the ground. The name actually is a reference to the water stream dispelled from it. 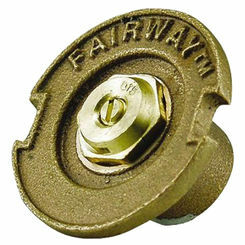 The water is sprayed directly out in a full-circle pattern to the surrounding area rather than having an arc to the spray as is common with many other sprinkler heads. 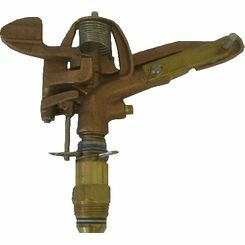 The spray usually ranges from about 10-15 feet which makes this sprinkling head ideals for smaller lawns or bushes. 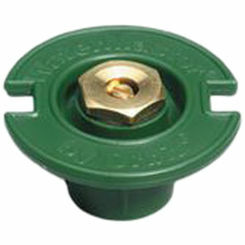 This plastic sprinkling head can also be installed on a pipe riser of almost any height. 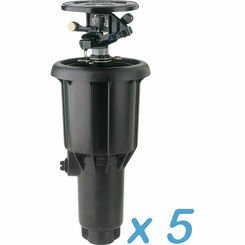 This could be useful with a group of bushes as they can be installed on the riser to reach above the bush height and to the roots of the plants. 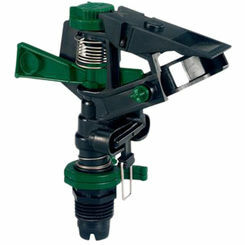 The flush sprinkler head is stationary and provides a constant spray. When Should You Water Your Lawn?